2015 Anne-Sophie Dubois, Fleurie, Cru Beaujolais “Clepsydre” Cuvee, France. 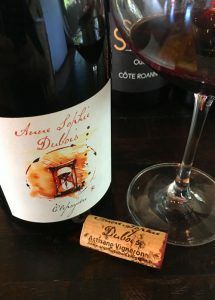 One of the newest stars on the Beaujolais seen, Anne-Sophie Dubois makes deeply pure and flavorful expressions with this one from the Cru Fleurie that gives wonderful floral perfume and a vintage, in 2015 that is ripe and concentrated, but with elegant class and texturally beautiful. The Clepsydre, named after an ancient water clock, once used in old Egypt, because Anne-Sophie believes it needs time to fully develop and blossom, is grown on pink granite soils, from a 60+ year old plot of high density vines, which gives a stylish mineral streak and heightened aromatics, she destemmed this 100% Gamay, with native yeast, cold ferments and neutral cask (4-7 old barrels) aging for about 13 months, all unfined and unfiltered. This 2015 is hedonistically dark in color with a black/purple saturation in the glass and a clear bouquet of violets and red rose petals which leads to a full palate of black plum, sweet cherry, strawberry and lingering tangy currant with a hint of walnut, mure and star anise. This is a weightless sensation that hides the density of mouth feel and a burst of energetic natural acidity that brightens the whole wine, everything is gloriously seamless and it’s personality and charm is quite additive, Dubois, imported by Thomas Calder (Pruf Rock) and Sacred Thirst, has a lovely touch with Gamay and this Fleurie is almost to Dutraive quality! This is a winemaker to keep an eye on, and if you are a Gamay fan you’ll want to explore her wines, especially this one, it should go for a decade with ease, I love this stuff!